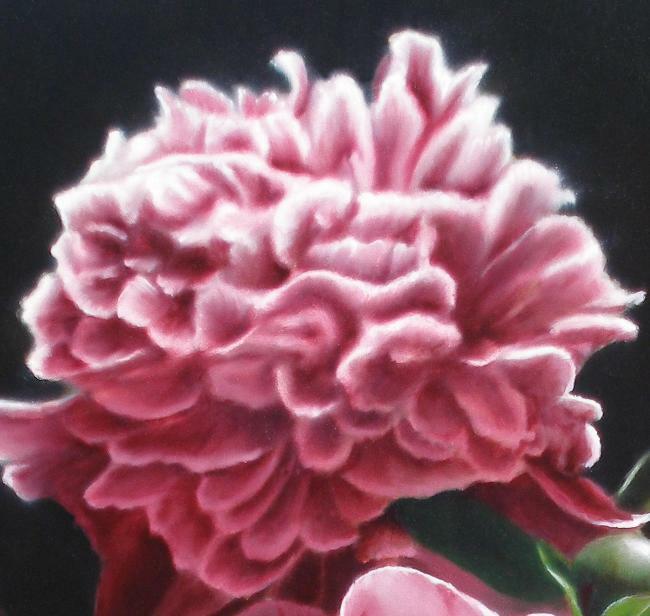 Japanese peony art, painting with demonstration of how it was created! 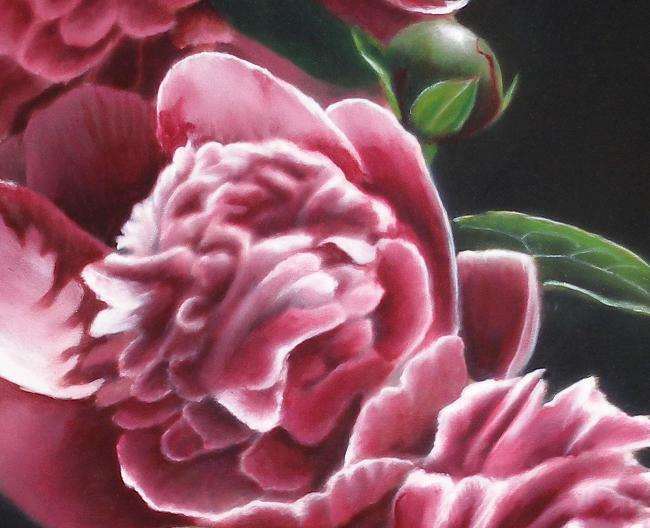 Japanese Peony Painting, The King of flowers, did you know? 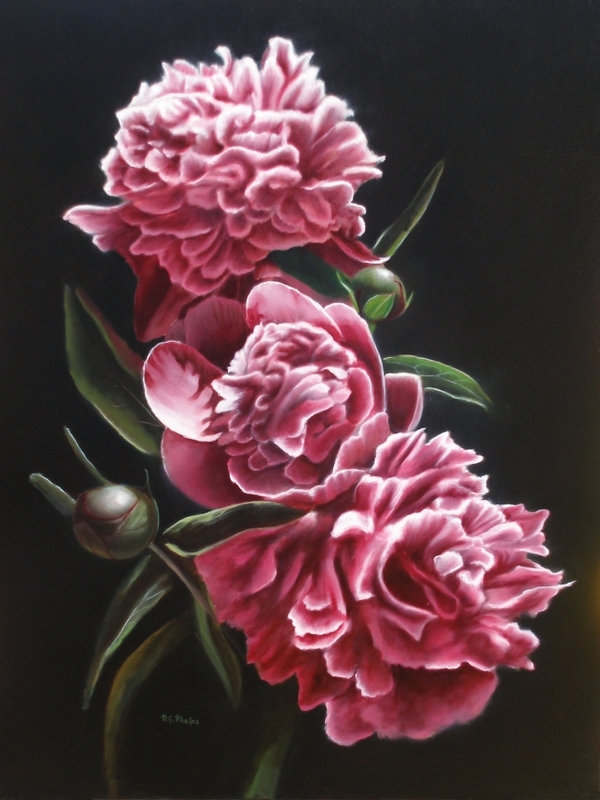 Home > Main Gallery Page > Japanese Peony Painting "Peonies Trio"
This heirloom variety from Thomas Jefferson's Monticello gardens where they are grown and sold is one of the few plants I myself have planted and it lives to this day! I'm not much of a gardener, so I'm thankful for the hearty variety that has survived my non-green thumb. I believe it is a Japanese variety due to it's guard petals with a flowering ball shaped center, and I seem to remember when we purchased it, the folks were pretty excited for this little guy being planted here in Virginia. I guess they knew I couldn't hurt it! Did you know the Japanese Peony is considered the King of Flowers and has a great deal of meaning behind it. It is said to bring wealth, honor, good fortune, and is associated with daring bravery. Because of this, it is not only a favorite flower to paint, but is highly regarded within the tattoo world. There are five different categories of the peony, the single, Japanese, anemone, semi-double, double. This Peony flower is a transition between the singles and the doubles. It has five or more guard petals surrounding the flower center, the stamens are partially changed into short skinny petals. This makes for its feathery appearance. Usually the center petals vary in color from the outer guard petals. This leads to some impressive and striking color combinations. You can find this flower all across the spectrum of the art world. Not just found in paintings such as this, but in tapestries, and on porcelain. Clicking an image will zoom in, and the main picture you can super size by clicking the upper right hand corner. 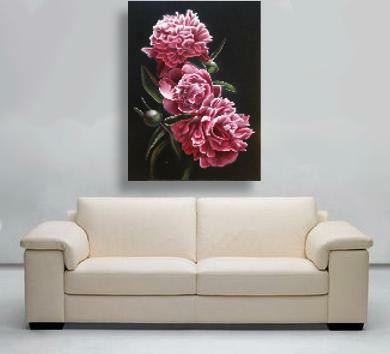 Japanese Peony Oil Painting, own it! 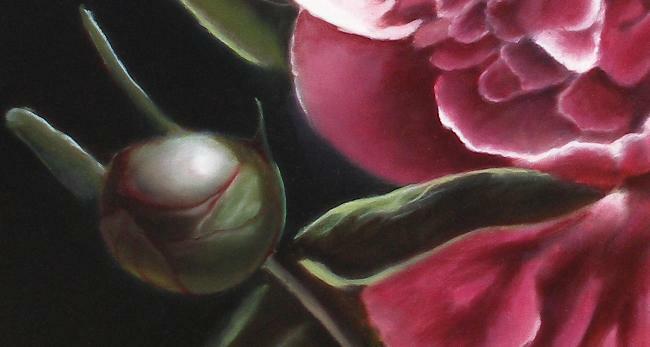 The richness in this pink against a black background intensifies the peonies even more. They will bring you a touch of kingship into any room you display it! It is on gallery wrapped canvas and ready to hang. See my sales page for more details on shipping, and price! You can order your painting here on my Etsy Shop! 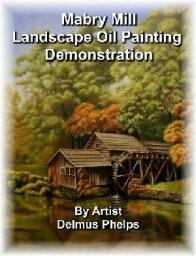 Or buy it direct from me on my commerce site, Delmus Phelps Fine Art. Are you interested on how this painting was created? Click the link or picture to find out the story behind the finished product! Need more information on my painting method and guarantee when buying art online? Click the link, it opens within a new window for you.